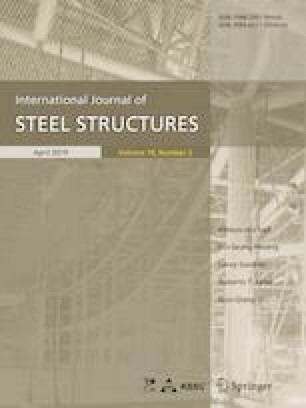 The elastic stiffness of the panel zone in diaphragm-through connection between square steel tubular column and H-shaped steel beam subjected to lateral loads is studied in this paper. Through analyzing the deformation mechanism of diaphragm-through connection, the rotation of the panel zone is found to be the superposition of bending deformation of the column and shear deformation of the panel zone. Based on the mechanical model, the computational method of the elastic stiffness of the panel zone in the diaphragm-though connection is developed. To verify the computational method, three cruciform specimens were tested subjected to a set of anti-symmetrical cyclic load at the beam tips. Based on the test results, the developed finite element model is verified and used in the follow-up parametric analysis to check the applicability of the proposed computational method. Key variables involved are the width of column, thickness of column and the height-to-width ratio of the core tube. The research was financially supported by the National Natural Science Foundations of China (Nos. 51268054 and 51468061) and the Natural Science Foundation of Tianjin City, China (No. 13JCQNJC07300). The financial supports are greatly appreciated.